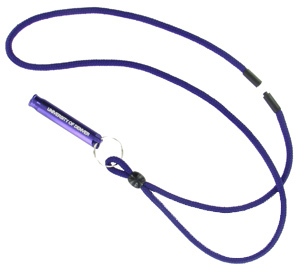 Whistle lanyards feature a loud safety whistle with breakaway security cord. Price includes single side laser engraving on whistle. Add $.25 for second side. Need more than 2500 pcs? Please contact us for best pricing! Security concerns at many businesses, schools, government agencies and public venues have dictated the use of personal identification cards for building access. Some have gone further to distribute very loud safety whistles as a means of drawing attention in case of emergency. Whistle lanyards combine our best selling aluminum metal safety whistle keychain and a convenient neck lanyard with inline safety breakaway connector. Metal whistles are custom laser engraved on one or both sides with your name, logo or message. Blank whistle lanyards are also available.